Using information Communication Technology (ICT), is crucial to most businesses, regardless of size. It is important to a company aiming to expand and to improve efficiency. The use of good ICT also improves customer services and customer demand. From database development, website design to market research, translation software, direct mail marketing and training, the application of ICT is critical for a economic success. The internet is one of the ways in which media companies / businesses advertise. The main form is advertisements or ‘prompts’ on media focussed websites. One example is the i-Tunes website, through which millions of people purchase and download music. The site automatically recommends similar CDs / DVDs to the one being purchased by the customer. This is direct marketing, taylor-made for the individual customer. Precise and deliberate programming, ensures that the customer is directed potential to further potential purchases. Furthermore, previous customer purchases are recorded, allowing the software to build an accurate customer profile on each I-Tune member. Tele-marketing is often used by media companies, especially ‘sales departments’ to generate appointments with potential customers. Company Directory Software is used to identify decision makers within companies, capturing their details. 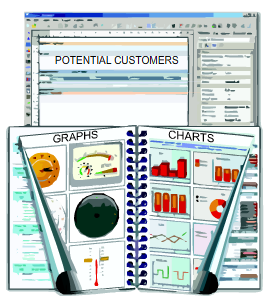 Often electronic versions of customer database lists are purchased, allowing sales to contact potential customers directly. The objective being, to secure appointments that lead to orders. Direct mailing is a way in which DVD production companies send material / product information, directly to potential customers. The aim is to focus on real customers rather than sending catalogues / information to people who have very little interest in the product. Direct mailing takes two forms. Mailing through the post and emails. DVD production companies keep up to date customer databases, saving thousands of pounds on future marketing campaigns. This ensures that advertising is directed to the people who have a potential interest in their products or services. Questionnaires are used as a marketing and research tool. A well designed questionnaire will allow companies to compile up to date and accurate information. The questionnaire should be composed of appropriate questions, with proper wording and flow. DVD production companies use this approach, especially when gathering information on the internet. Free software such as Google Docs allows online questionnaires to be compiled and then analysed automatically. This software is available for all to use. A noteworthy DVD production company has its own website. For example, Sonymusic.co.uk promotes new releases. Often a media company will produce a website, for a specific artist or their most recent album. Free downloads of tracks encourage the purchase of further tracks and promote live events. Video trailers are produced to encourage attendance at cinemas or the purchase of films / music. Promotional Presentations such as; PowerPoint presentations, video presentations and animation software are used to promote DVD and CD products, usually new releases. Sony promote new music releases through YouTube, sonymusicSME's Channel. Videos promote singles and music from a range fo bands and artists. Sony also promotes its music CDs through the Twitter website (twitter.com/SONYMUSICGLOBAL). Reporting and Analysis include the production of glossy brochures and catalogues. This is driven by DTP and Graphics software. CD and DVD covers are produced using specialist graphics software. All companies report annually to investors, often in the form of pamphlets and booklets, often available in electronic form. Accounting and spreadsheet software is used to keep accurate records of sales, manufacturing, advertising and distribution costs. Translation Services are key to a business wishing to expand overseas. The DVD industry is international and so translation, in terms of the written word and literature is extremely important. Translation software is used to translate DVD and CD covers into a variety of languages. ICT provides companies with a range of tools, crucial to marketing and success. ICT drives the manufacturing process, at almost every stage of production, including the production line to quality control. In todays world it is unlikely that a business can be successful, without applying ICT solutions. Much of the worlds economy is driven and managed by ICT. Governments, companies and often individuals rely on the use of ICT. In order to secure a business future, DVD production companies, constantly look for the next step in the use and application of ICT, hoping to ahead of their competitors.